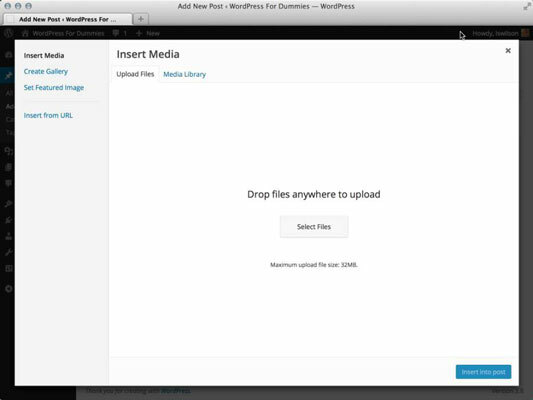 Adding images to a post is pretty easy with the WordPress image uploader. Jump right in and give it a go by clicking the Add Media button on the Add New Post page. The Insert Media window opens and lets you choose images from your hard drive or from a location on the web. Click the Insert From URL link in the Insert Media window. The Insert from URL window opens. Type the URL (Internet address) of the image in the URL text box. Type the full URL, including the http and www portion of the address. You can easily find the URL of any image on the web by right-clicking (PC) or Control-clicking (Mac) and selecting Properties from the menu. Type a title for the image in the Title text box. (Optional) Type the caption of the image in the Image Caption text box. The words you type here display underneath the image on your blog as a caption — if your current theme supports image captions. Type a description of the image in the Alt Text text box. Search engines read the alternate text (also called ALT tags) and give search engines additional descriptive text to further categorize and define your site in listings and directories. Choose an alignment option by clicking the Left, Center, Right, or None button. Select what you would like the image hyperlinked to. Image URL: Readers can click through to the direct image itself. Custom URL: Type in your own URL that you want readers to visit when they click on the image. None: Select this to attach no hyperlink to the image.